When people ask me who is Japanese – my father or my mother – I hesitate, every single time. That’s because nearly everything I consider to be Japanese – came from my Australian mother. In her early 20s, she went on a two-week holiday to Japan, and ended up staying for nine years. She fell in love with the people, the food, the culture and the language – and all that came back to Australia with her when she returned. So, I grew up in a household where Mum was at the centre: cooking gyoza and karaage and okonomiyaki. We sat on zabuton around a low table. And we ate from flat plates with hashi. All this in a small Australian town, where, outside the big wooden doors of our country home, we had chooks and ducks and horses and dogs and cats. And what Japan was, to me, didn’t stop at food. It was at the core of our life because it was at the core of Mum’s life. She taught Japanese, she wrote books for teachers so they could teach Japanese, she trekked to tiny mountain towns in Japan and found fabrics – yukata and kasuri and indigo – and brought them back to make clothes here. And her love of ceramics was part of our life, too. So I grew up knowing I was Australian but, at the same time, feeling like all the normal things in life, were Japanese. It was an odd combination, especially when everyone I saw around me – on TV or in sports teams or in rocks bands – didn’t look like me. They were blonde haired and blue eyed, girls rode surfboards and were tall with white shiny teeth. The one place I always felt at home, even as small child, was Japan – especially Tokyo. My sister and I spent a lot of time there as kids – and the magic of the place never wore off. I loved the senbei shops and the stationary and all the little things I could buy. I loved that I could find stickers with my name in it – in hiragana and katakana – there were never any ‘Kumi’ stickers in Australia. But it was more than what I could buy. Even as a small child, I remember coming back to Australia and things not feeling ‘right’. I found people loud, I thought it was rude when people ate their food on the street; and when I got older, I found I got frustrated at trains that were late and buses that didn’t turn up – on time, or at all. When I went back to Japan, all that frustration slipped away. The place just seemed to work so well. Or at least work in a way that suited me. Because that same Japan didn’t suit my Japanese Dad as much. He chose to stay here from when he arrived – at 41 – to when he died – at 84. He loved the freedom of the life here, the fact he could play golf for next to nothing, the fact he could grow vegetables in his small garden. He liked the pace and the lifestyle. He chose Australia over Japan. And this is something I think about a lot – this idea of choice. Do we have to choose where we live, where we feel most at home? Can we have split lives, where we feel comfortable in one country for some reasons, and comfortable in another, for other reasons? Or, more controversially, what happens if we find ourselves living in one country but would really prefer to be living in another? I have been exploring this idea for the last 18 months, intensively, while researching and writing my book. I have been back to Japan twice this year and have looked at it through different eyes, especially after my Dad passed away. I have wondered what made him choose Australia over Japan and why I, even though I grew up in Australia – feel more comfortable and at home in Japan. Kumi was born in Melbourne to her Australian mother and Japanese father. She grew up in the country, riding horses and raising chickens. Kumi trained as a classical violinist and got into university on a music scholarship, but her love of storytelling took over. Her first media job was at the ABC’s 7.30 Report in 1997, where she picked up dry-cleaning, organised couriers and transcribed the answering machine. Kumi then worked at Triple J radio and regional radio, before moving to Hong Kong. There, she worked for Star TV and Asia Television, running a weekly social affairs program, reporting and anchoring the nightly news. After six years overseas, Kumi returned to Australia at the end of 2010. Initially working at both SBS and the ABC, she settled full-time at the ABC in 2011. Kumi has worked across a variety of programs and mediums at the public broadcaster: anchoring and reporting for TV News, hosting local radio, co-anchoring ABC News Breakfast and co-hosting programs such as Stargazing Live. Since 2017, Kumi has also hosted Compass, the country’s only program focussing on purpose, ethics and faith. 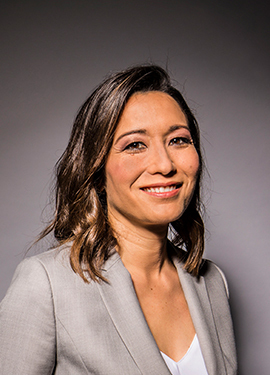 Kumi is also part of the broadcaster’s peer support program, actively championing mental health awareness; and is on the ABC’s Diversity Working Group. Kumi regularly emcees events and hosts panel discussions. Kumi is always up for an adventure, especially one that pushes her physical and mental limits. She has reported live from the Sydney to Hobart yacht race, taking four days to sail the 630 nautical miles on a 70-foot yacht. And her first (and possibly only) marathon was run in central Australia, near Uluru. Kumi’s first book, a memoir, will be published in 2018. Does your lesson content sound like a travelogue year after year? Are we missing opportunities to engage our students in deeper topics? Should our language classrooms only focus on language? Do students have to have language skills first to interact with current issues their lives present? World language classrooms provide a unique advantage to examine human and environmental issues from a new lens. I have been teaching Japanese language and culture to American students, ranging from kindergarten to high school over 25 years. When I started teaching I quickly learned that engagement is the key for successful learning. Research in neuroscience over the past 20 years confirms what we know from experience in the classroom. (See “Emotions, Learning, and the Brain” by Mary Helen Immordino-Yang.) Over the years, engaging students has been my primary focus in classroom instruction. I must say that I became quickly adept at “dancing” to capture learners’ attention, while introducing mandated topics such as classroom, family, food, etc. While the vocabulary and language structures presented in such topics might be beneficial and even necessary to converse with Japanese speaking individuals, “what” we talk about is often mundane and requires “entertainment” from teachers in order to make the process of “learning about the language” more tolerable. Ten years ago or so one student said to me, “I love your class because my Japanese gets better just being in your class. Thank you.” What she meant as a compliment felt more like a blast of cold water in my face. She had it easy because I was doing all the work for her! I was taking away opportunities from her to interact with the rich content that the world offers by engaging them in fun activities instead of meaningful activities, and demystifying content instead of allowing them to discover on their own. I was providing all the answers instead of allowing multiple answers, and avoiding uncomfortable topics instead of facilitating conversations to reach deeper understanding. How can I better provide a learning environment wherein learners are truly engaged in the topics crucial to them and our future? Can “real world content” be the drive of language learning? What roles do the language and culture play in this process of interacting with the new learning? Is it possible that learners acquire language skills as their eyes focus on the content? What content are essential to know for world citizens of the future? We have no shortage of topics as the world is a complex place and it constantly challenges us with issues, and it is never static. Income inequality, human rights, environmental issues, immigration issues, poverty, politics, social pressure, to name a few. How can language classes bring in such topics traditionally opted-out from current conventional textbooks? During this process, both students and teachers not only gain knowledge of the issues but also deeply connect to “others” while acquiring the language skills to obtain information and express their thoughts and feelings. In the technologically advanced world, it seemingly appears that we are better connected – yet also disconnected. What are the crucial skills our students must have to thrive in the future? Is it possible that through language study we help learners cultivate human skills to connect, evaluate, empathize, and strategize? 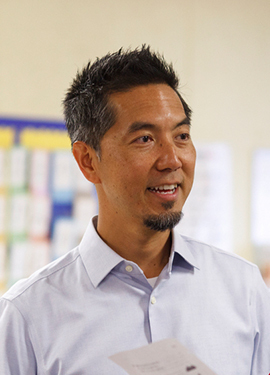 Join in exploring one teacher’s journey in bringing social justice issues to the center of the lesson and how it connected students’ hearts and minds in becoming agent of change. Yo Azama currently teaches Japanese at North Salinas High School and World Language Teaching Method course at California State University, Monterey Bay. He is a team leader of the Monterey Bay World Language Project. He has 23 years of teaching experience from kindergarten to high school. He has conducted over 300 presentations and seminars regionally, nationally, and internationally on various topics including; Social Justice Infused Lessons, Motivational Curriculum & Syllabus Design, Classroom Management, and Effective use of Technology in World Language Classroom. He has also served as a College Board Advisor for AP Japanese Language and Culture Development Committee. He enjoys running, traveling, and playing music with friends.